This season YMHF introduced a number of new items to the craft collection at the Handicraft Center. These include Yi and Tibetan baskets, silver jewelry, local traditional dress, wall hangings, pottery items and other products made in Shangri La. We have expanded our popular wooden bowls and bangles from Benzilan’s new workshop. Each of these products comes with a story often which includes investigation, experimentation. Baskets: While looking for baskets for the Spa Product line, we discovered very few suitable options to choose from. 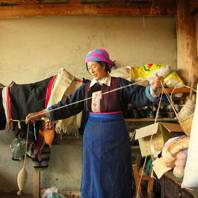 Eventually it was discovered that both Yi and Tibetan local mountain communities make baskets for home use. This inspired the new partnerships with these groups to make baskets for the project. The results were charming and are now on sale in the Handicraft Center. These baskets are made for use in traditional life; however the communities had never considered selling them. 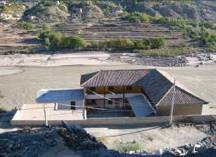 This project is good example of bringing traditional crafts from the village to the market. Shangri La Tibetan Sewing Workshop: Some interesting Tibetan inspired fabric items are made by young Tibetan women from Shangri La who are starting a sewing workshop. 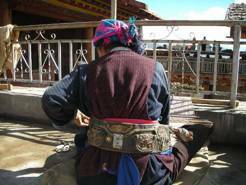 They are experimenting with new ideas with Tibetan motifs. They seem to have a knack for using good materials, good color combinations and show attention to details. We have commissioned a few special contract items for the Handicraft Center and also buy ready made products from them directly. Silver Jewelry: Local silverwork is a well known local craft and there are several artisans engaged in making jewelry and pounded silver knife sheathes. Under the guidance of YMHF volunteers Matt Walker and Tracie Blummer, silversmiths from the USA, we began to experiment with some local traditional silver items, notable earrings with coral and turquoise stones. The jewelry is selling well in the Handicraft Center, especially the silver earrings. Inventory Update The inventory of handicrafts was updated this spring by Belinda Wong Swanson and Berit Klandt. We now have photographic records of the crafts as well as measurements and other relevant information on each piece in the Center store. Leslie Skalak and Clare Randt helped reorganize and update our store displays, giving the Center Store a new fresh appearance. He Lin will keep the inventory updated on a weekly basis with the arrival of the accounting chart from Handicraft Center. Craft Table at the Town Square: Cards promoting the Center and its activities are now available in the town square craft market. Advertising Cards: To increase tourist flow to the Center, in August 2007, we produced cards to be placed in local restaurants, guest houses and other such locations. Volunteers Leslie Skalak and Carissa Fletcher redesigned the map to the Center and created an updated version of our advertising card for the summer 2008 season. This card has worked well to attract patrons from hotels, guesthouses, cafes and other sites popular with tourists. Additional Signs around town: Many new wooden signs were placed along the roads leading to the Center in April. Yak Butter Tea: The cards along with the new signage through out the Old Town have helped tourists find the center and added to our casual drop in client rate. 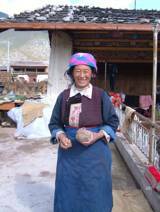 The Yak Butter Tea Demonstration (see below for more information) also continues to be a successful tourist draw. According to our survey, 70% of the visitors to the Center buy products in the Handicraft Store. 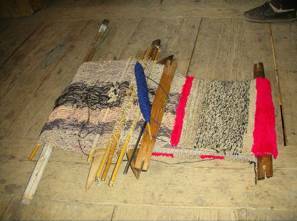 Weaving for visiting tourists: small back strap looms were made to teach tourists the fundamental principals of local weaving. The looms used by local weavers are often portable and can be carried to the fields, mountains, or even to a friend’s porch for communal weaving. The Center commissioned small looms which can be bought by the visitors as a contribution to YMHF artisan projects. The loom, back strap, and wool will be provided by the Center for the lessons. Holiday Sales in Beijing In November and December 2007, The Handicraft Center participated in three International Holiday Bazaars, the Rotary Club Bazaar at the Hilton Hotel, the Embassy House Holiday Sale, and the Ambassador Spouse Club. There was much interest in our goods and sales were good. This is a good way to boost revenue during the quiet winter months in Shangri La. On arrival to the village of Hamagu, situated between Mount Shika and the city of Shangri-la, Lo Sang Ciu Cu was one of the first smiling faces to great us. At the time she was busy sifting grain from recently harvested barley wheat (which will later be used to make tsampa), but she agreed to take a break and introduce us to the weaving handicraft as she has learned it from her mother. Lo Sang weaves bed coverings and rugs from sheep or yak wool taken from the community’s livestock, and she also sews clothing made from textiles bought in local markets. Working with deft fingers and an easy concentration, Lo Sang showed us how to weave the wool in a looping style that, when cut through after reaching the end of one line of the weft, began to take on the familiar look of hand-woven rugs that we knew from the YMHF shop in Old Town Shangri-la. 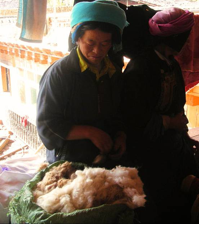 It takes about one month to make one of the lamb’s wool blankets, and she can also make wraps out of yak hair, which though a bit coarser than the sheep wool, is an effective protection against Shangri-la’s winter winds. 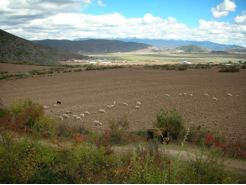 Hamagu Village, situated between Daju Gorge/Shika Mountain on the Napa Hai wetland plains and the city of Shangri-la, is an agricultural and pastoral community who has recently begun to develop income options in eco-tourism and handicrafts. Twice a year the sheep are shorn to make wool, which in turn will be made into a tri-thread yarn. This yarn is then hand-spun onto spools to be used in weaving. The spinning of wool into yarn is typically the domain of the women of Hamagu, and most of them begin to study the craft around the age of 20 or so. In addition to practicing this handicraft herself, Lo Sang Ciu Cu (left) also teaches it to other villagers and relatives. What was once a skill that may have been shared only in nuclear families is now a community-building handicraft that can benefit several households. The loom is a simple and portable design. Unlike the large frame looms which most people are used to seeing, this one does not need to be set up and left in one place. A series of wooden rods of various sizes maintain the weft while the warp maintains its tension by virtue of the weavers own body, using a utility belt (pictured below) and tied off at the other end to any secure point (which, in the case of our demonstration, was the railing of a rooftop). This particular loom has been handed down from mother to daughter through a generations of Lo Sang’s family; however, if it were every lost or destroyed, a new one could easily be made using on hand materials. Walk into many Shangri-la bars, hotels and shops touting their commitment to ethnic preservation and their love of Yunnan Tibetan style, and you will no doubt see at least one of Lu Rong Yi Xi’s tsampa boxes. The fourth grandson of Ge Rong Yi Xi, Lu Rong Yi Xi is the beneficiary of a long standing family reputation of fine craftsmanship in woodwork and the modern-day bearer of an important story of Chinese-Tibetan cultural relations. According to the factory’s brochure, the Qing Emperor Kang Xi presented the Tibetan government with a tsampa box made in the Jingdezhen kiln. The tsampa box combined images of Tibetan and Han culture, and then during the early 20th century, the 13th Dalai Lama and the ninth Pan Chan Lama presented this very same box to the 6th Zha Tong Living Buddha of the Dong Zu Lin temple, in honor of his achievements. It is from here that the history of Chinese culture and Tibetan culture are joined with the history of Lu Rong Yi Xi’s family when the 6th Zha Tong Living Buddha commissioned grandfather Ge Rong Yi Xi “to copy the Kang Xi tsampa box with wood, [and] match it with coloured drawing and plant lacquer…This resulted in the town’s reputation as the hometown of the tsampa box.” The present-day Yi Xi means to ensure that this prestigious title holds. In 2004, Lu Rong Yi Xi established Shangri-La Traditional Tibetan handicraft factory in Benzilan township alongside the Jinsha River. Yi Xi’s factory not only passes on an important tradition to a new generation of artisans, but also allows for contemporary cultural enthusiasts to appreciate a once locally confined handicraft. Whether ultimately ending up as a tsampa box, a wine cup, a ghee box, vase or wine bottle, every piece begins as a raw block of wood. Yi Xi Factory has multiple workshop areas with lathes and wood chisels for spinning out the different size and style final products, and at any one time Yi Xi employs up to 15 local artisans, which means income for numerous families of Benzilan’s 2000-some population. The lumber is brought in from nearby forests and in addition to turning the wood, pine sap is also used to make the lacquer, an environmentally friendly alternative to the usual synthetic lacquers often used in wood treatment. From the wood turner’s lathe, each piece is then handed off to another worker who will sand down the rough edges in preparation for painting. For the golden tsampa bowls in particular, however, a reflective silver sheet coating must be applied before the artisans can add the gold and red paints to allow for the gold paint’s luminescence to shine. Once the tsampa bowls have been painted with several coats and the red detail work has been carefully added by the artists, then the plant lacquer can be applied. Every artisan, old and young, learns every part of the process and also teaches what they know to others, in keeping with Yi Xi’s ideas about preserving culture, handicraft skills and quality. After the bowls have been lacquered they will dry in special compartments that provide the necessary balance of warmth and air quality for proper drying before a final setting treatment in the sun. The entire process takes about 20 days for one piece. The Next Step: one family’s legacy becomes a community’s vision Upholding a quality of craftsmanship that cannot be achieved by a machine takes the hands of a skilled artisan and the development of relationships between artisans and apprentices to ensure that the handicraft is not lost to future generations. And for Yi Xi, the education of his workers means the education of the whole person. After work ends at 6:00 pm each day, the company takes their dinner together and then from seven to eight o’clock it is time for lessons. The employees study design, Tibetan language and culture and Mandarin Chinese. 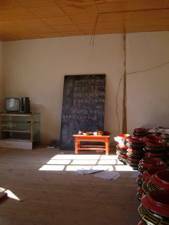 The classroom is equipped with a chalk board and mats for the student-workers to sit on and is located next to the workers living quarters in the factory’s small compound. Not small for long though, according to Yi Xi, “We have many plans for the future, and as we reach greater business success and gain further funding, we will add a canteen for the artisans, buy more materials and complete some other projects that we have already started on with the money we have made so far.” These other projects include offices on the hill (above) beside the factory (the foundations of which have been laid, both literally and figuratively) and planting trees on the remaining land that Yi Xi Factory has. “We’d really like to expand our selling area to Chengdu,” Yi Xi tells me as we climb back toward Benzilan where Yi Xi will help me choose a Christmas gift for my grandmother, taking local Zang culture across the sea.